Company that decides how and why the data will be processed. Wherever we refer to consent as a justification for data processing, this presupposes that you have effectively given us such consent; if you have not provided us with the respective consent we will not process your personal data for purposes that require your consent. your data subject rights in relation to the personal data we process. We do not process sensitive (“special”) data categories of our customers and service users. Sensitive (“special”) data categories not processed by us include data that reveal racial and ethnic origin, political opinions, religious or philosophical beliefs, as well as genetic data, biometric data to uniquely identify a natural person, health information or data to the sexual life or the sexual orientation of a natural person. If If users provide unsolicited information containing sensitive (“special”) data categories to us (e.g. by entering an email revealing sensitive data such as a function within a church or a trade union in a registration form), such data will only be processed as part of the fulfillment of the contract (or the contract initiation), as requested and entered by you. We only collect non-personal app usage data. We do not process any information about individual users’ usage of our services except where, and to the extent that, it is technically necessary for the performance of such services. We collect information about taps on app screens and views on the screens to better understand how well our offering is serving our users globally. We use events data to improve our service. 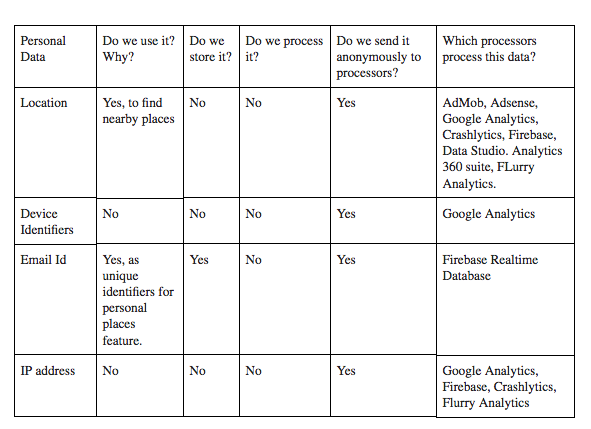 A summary of Personal Data used within WAM app is mentioned in “Table 1” below. To select employees who have a business purpose to access personal data. 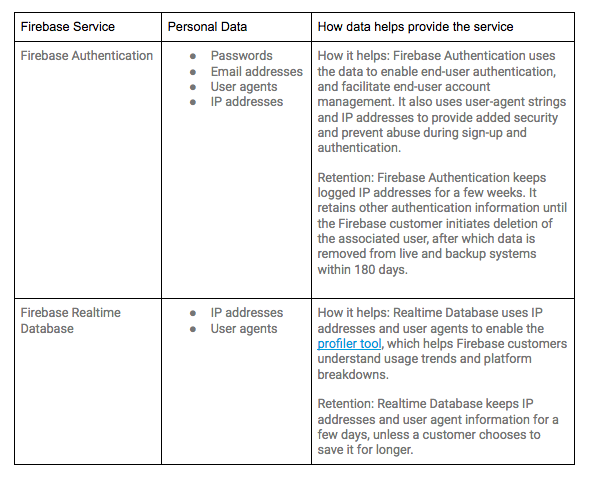 System logs employee access to systems that contain personal data. System only permits access to personal data by employees who sign in with Google Sign-In and 2-factor authentication. In addition, the Application may collect certain information automatically based on your consent, including, but not limited to, the type of mobile device you use, your mobile operating system, and information about the way the Application is used by a set of users. Location is sent to Data processors as mentioned in Table 1 above. World Around Me includes measuring tools. We want to learn how users use the app so we can improve it in future updates. The data is anonymised and aggregated and is used to measure app usage and other functions. Your consent, Art. 6 no. 1 a GDPR. Whenever you use our services, we automatically collect and store this information. When you visit the mobile application, we use GPS technology (or other similar technology) – only with your granted permission, to determine your current location in order to determine the place you are located within in order to serve you with relevant search results. For example, if you are looking for Restaurant in paris then we will furnish name and location of Restaurants near you in paris. Location accuracy is 10 metres. We do not store the location coordinates anywhere. Do we serve personalised advertisements? Personalised advertisements are ones which target users based on their online viewing behaviour of websites and apps. Non personalised advertisements are ones which are targeted to users based on their location and many times they are served without knowing about users location. We serve only non-personalised ads in our Application. if WT Infotech is involved in a merger, acquisition, or sale of all or a portion of its assets, you will be notified via a prominent notice on our Web site of any change in ownership or uses of this information, as well as any choices you may have regarding this information. We will not share your personal data with any third party companies, organizations or individuals for their own purposes as an independent company unless we do have your active (meaning: opt-in) consent. In addition, we will share your personal data only if one of the subsequent circumstances applies. We only process non-personal (anonymized) data on a regular basis for analytics purposes to Google Analytics. Google Analytics is a service by Google LLC, Amphitheatre Parkway, Mountain View, CA 94043, USA. World Around Me is not a social network itself, but it uses social network logins for authentication. World Around Me connects above networks so you can Sign-in to the personal places feature in the app. The User registers by filling out the registration form and providing the Personal Data directly to this Application. Personal Data collected: Email. Our storage of personal data is always limited to the period necessary to achieve the purpose of the storage. Where a storage period prescribed by European regulations and directives and/or any other relevant legislation has expired, the personal data will be routinely blocked or deleted in accordance with the statutory provisions. If you have purchased mobile app WAM Pro from WT Infotech, your data will be stored for as long as their use is required for the execution of the contract (e.g. contract handling) and, moreover, for the fulfilment of legal obligations (retention or accounting obligation). Your data will be deleted as soon as they are no longer needed to fulfil the contract and, moreover, all legal obligations for storage have expired. The Data is kept for the time necessary to provide the service requested by the User, or stated by the purposes outlined in this document, and the User can always request that the Data Controller suspend or remove the data. The Data Controller will retain User provided personal data for as long as you use the Application and 50 months thereafter. The following precautions to make sure it cannot be accessed or altered – Data is encrypted in transit using internal security protocols. We do not use the Application to knowingly solicit data from or market to children under the age of 13. If a parent or guardian becomes aware that his or her child has provided us with information without their consent, he or she should contact us at privacy@worldaroundmeapp.com. We will delete such information from our files within 4 weeks. Your personal data about the “Personal Places” feature in WAM will be stored at least for as long as necessary for you to access WAM. If at any time you’d like us to remove all your personal data on WAM then please send us an email and we shall respond to you within 1 week with the report of data removal. We are concerned about safeguarding the confidentiality of your information. We provide physical, electronic, and procedural safeguards to protect information we process and maintain. For example, we limit access to this information to authorised employees and contractors who need to know that information in order to operate, develop or improve our Application. Please be aware that we endeavour to provide reasonably high level security for information we process and maintain. Right of access: Upon request, we will inform you about the scope, the origin and the recipients of your personal data processed by us as well as of the purpose(s) of such processing. In case of excessive Requests for Access (more often than 4 times a year), we reserve the right to charge an expense reimbursement. Right to rectification: Should any personal data related to you as processed by us be incorrect or incomplete despite our efforts to ensure that the data is accurate and up to date, we will correct it at your request. Erasure: Under certain circumstances, you have a right to erasure, for example, in connection with a contradiction or when data was collected illegally. If the legal prerequisites for an erasure are present (meaning that there are no legal obligations or predominant interests against the request), we will carry out the requested erasure immediately. Restriction: You may also request a restriction of the data processing for the same reasons that justify an erasure. In that case, the stored data must remain stored (ie for evidence purposes) but may no longer be used otherwise by us. Right to object and withdrawal of consent: You are entitled to object against any data processing conducted by us based on a legitimate interest. Upon objection we will cease to process the respective personal data except for exceptional cases where we have compelling legitimate grounds for the processing which override your interests; as regards data processing for direct advertising purposes, this right of objection has an absolute nature, we will thus never invoke compelling legitimate grounds overriding your legitimate interests if you object to use of your data for advertising purposes; Any consent you have given to processing of your personal data can be revoked at any time in writing and free of charge (for contact see sec. 1 above). What are my opt-out rights? You can stop all collection of information by the Application easily by uninstalling the Application WAM app from your mobile. You may use the standard uninstall processes as may be available as part of your mobile device or via the mobile application marketplace or network. Data portability: If you wish to transfer provided data to another controller, we will provide the data in an electronically transferable format. Right of appeal to the Data Protection Authority: We also remind you of your right of appeal to the Data Protection Authority. You have the right to complain to a supervisory authority, in particular in the Member State of your place of residence, your place of work or the place of the alleged infringement, if the data subject considers that the processing of the personal data is in breach of this Regulation. You may also contact us directly at any time. To exercise these rights, please use the contact information under point 1. Please note that we may request submission of documents and/or information to verify your identity when treating your request. We do so in order to make sure that your personal data is never disclosed to a third party not entitled to receive your personal data.